Quality music is a vital part of every worship service because God is the audience and God deserves our very best! At Eastminster, our music is wide-ranging in style. In addition to singing traditional and contemporary hymns each week, our Adult, or Handbell Choir offers an anthem that enhances the season of the year or the theme of the worship service. The Adult Choir, directed by Chelsea Berner, sings a variety of traditional and ethnic music, including anthems from Iona Community in Scotland and a variety of old and new favorites. The choir sings from September to June three Sundays a month. They practice Thursdays at 7:00 p.m. New members are always welcome to join the choir. All you need is a love of singing! The Eastminster Hand Bell Choir is a group of adult ringers which meets for weekly rehearsals on Tuesday evenings at 7:00-8:30 p.m. in the Green Room. The group, directed by Heather Myer, provides music for the 10:30 AM worship service one Sunday a month from September through May. The Hand Bell Choir rings on Eastminster’s four-octave set of Schulmerich hand bells. New ringers are welcome to join. Bell choir is an enjoyable way to praise God! Tamar Mikeladze provides beautiful sacred or classical music during the Prelude, Offertory and Postlude. Guest vocalists or instrumentalists are frequent additions especially at Christmas and Easter and during the summer. 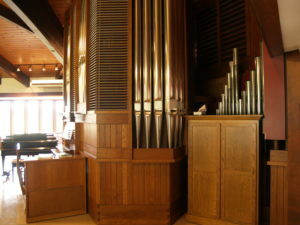 In December, 1995, the firm of Lynn Dobson (Lake City, IA) installed a two-manual tracker pipe organ in the sanctuary. This small but versatile organ has mechanical key action and a natural style of voicing, which makes it a perfect fit for the intimate setting of the sanctuary. The organ is a regular part of our musical expressions in worship.